Why Do People Not Like Puns? A lot of people hate puns. They think puns aren’t funny. And often they’re right. That’s because many puns lack one or more of the characteristics of a good joke. The reason that joke isn’t funny is because its topic—“I’m glad I know sign language”–isn’t true. A good joke topic is true. If you start a joke with a topic that your audience doesn’t believe, they’ll be focusing on that lie instead of paying attention to your joke. Your audience won’t be engaged by a topic that’s not true. 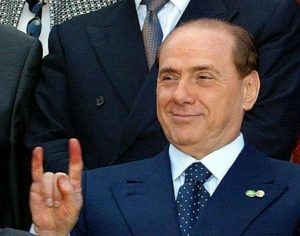 Instead they’ll be thinking, “That guy doesn’t know sign language. He’s only saying he does to set up some tricky punch line to show us how clever he is.” Thus distracted, your audience won’t laugh. The punch line of that joke–the photo of the plates–is visual. A visual punch line can theoretically get a laugh. But that visual punch line won’t because it’s not surprising. A good punch line is surprising. In a well-constructed joke, the topic and the angle (also known as the setup) lead the audience in a particular direction. The laugh comes when the punch line veers off suddenly in a new, unexpected direction. 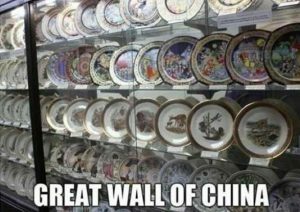 But in the joke above, the setup (the words “Great Wall of China”) and the punch line (the photo of the plates) are both visible at exactly the same time. There’s no surprise in that, no sudden revelation of a truth, just, again, a demonstration of the writer’s cleverness. But a punning joke that is well-constructed can get a big laugh. One reason that joke got a lot of votes is that it follows the rules of good joke-writing. The topic rings true: celebrities actually did pose for those photos. Who would make up an odd news item like that? And the punch line is surprising. The wordplay–“crabs”–arrives at the very end of the joke, only after the topic and angle have misdirected the audience. So don’t hate puns and other wordplay jokes. They’re not all bad, just the ones that are badly written. Why aren’t Jimmy Fallon and Seth Meyers doing more field pieces on their shows? Field pieces, or “remotes,” are comedy pieces that are shot outside the studio. They’re great for comedy/talk shows. Here are 5 reasons why. 1) It’s fun to see the host out in the real world for a change. Watching the same guy behind the same desk on the same set night after night can be boring. Getting the camera out of the studio breaks that visual monotony. 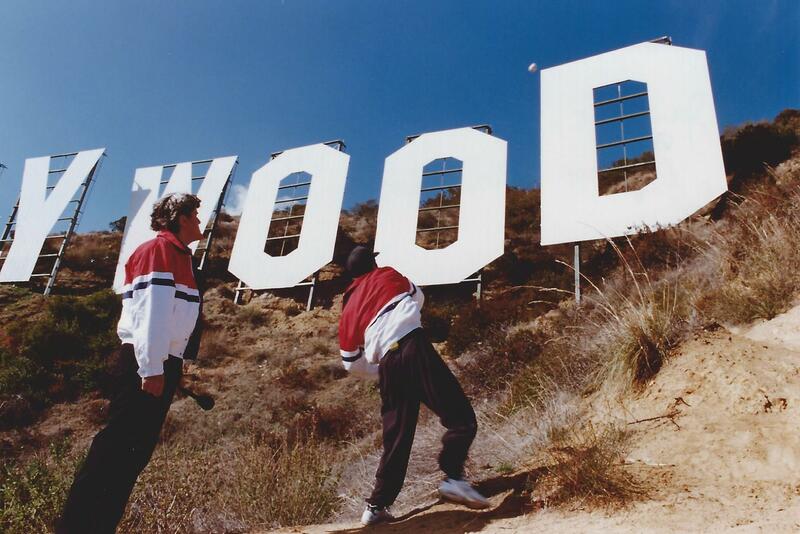 I help Charlie Sheen’s “athletic trainer,” Kim, down the hill to the Hollywood Sign. 2) Shooting only in the studio building limits your comedy options. Sure, you can produce a lot of fun comedy pieces indoors. I was once responsible for Dave Letterman and Paul Shaffer racing down a hallway inside 30 Rockefeller Plaza on dogsleds. But I also persuaded Dave to drive a rental convertible through a carwash with the top down. The world is your playground. Why stay cooped up in the clubhouse? 3) Field pieces don’t have to be expensive. To produce most field pieces all you need is a camera operator, maybe an audio technician, maybe a director, and your on-camera talent. And you’re already paying those people. 4) Field pieces don’t have to be time consuming. Jay Leno and his staffers could shoot a semi-scripted remote involving civilians, like “Jaywalking,” in an hour-and-a-half. Even a more elaborate remote is often producible in a couple of hours. I discuss the proposed stunt with Jay and Charlie “Major League” Sheen. 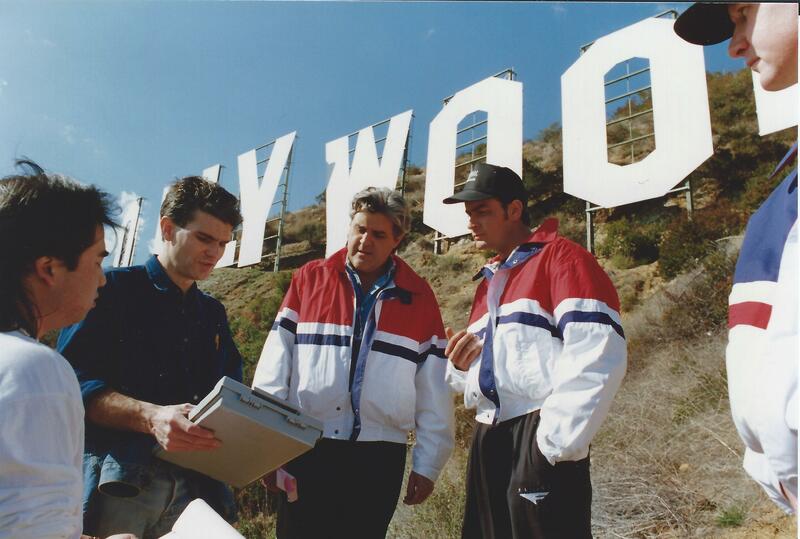 For example, one time I took Jay and Charlie Sheen up to the Hollywood Sign, where Charlie threw a baseball through the D; the Olympics were underway and we made that Charlie’s event. We shot the piece in the morning, edited it that afternoon, and rolled it into the show that evening during Charlie’s interview. 5) Field pieces can be edited. If, say, the piece involves the host using unpredictable civilians for comedy, all the weak material can be cut out before the piece airs. That’s why finished field pieces tend to have a high laugh density. 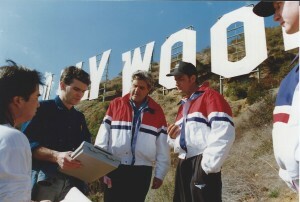 Jay Leno did field pieces often. Dave Letterman, Conan O’Brien, and Jimmy Kimmel (or one of their correspondents) do field pieces. The streets of Manhattan are certainly a convenient and target-rich environment for comedy. So here’s hoping that Jimmy Fallon and Seth Meyers take advantage of the pleasant weather and get out more often. Jay watches Charlie hurl a baseball through the D. Success! With their improv skills I think they’d be terrific at field pieces. Feeding the late-night beast every day is harder than it has to be if you’re only ordering off one side of the comedy menu. 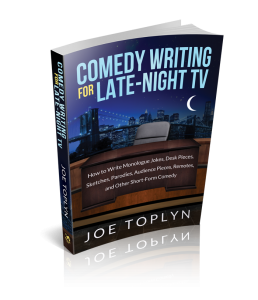 Learn more about how to create successful field pieces in my book Comedy Writing for Late-Night TV.